Wake County is a county in the U.S. state of North Carolina. As of the 2010 census, the population was 900,993, making it North Carolina's second most populated county. 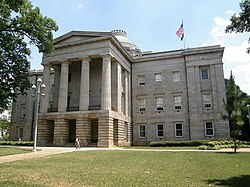 Its county seat is Raleigh, which is also the state capital. Wake County is part of the Research Triangle metropolitan region, which encompasses the cities of Raleigh and Durham, the towns of Cary and Chapel Hill, and their surrounding suburban areas. The regional name originated after the 1959 creation of the Research Triangle Park, located midway between Raleigh and Durham. The Research Triangle region encompasses the U.S. Census Bureau's Combined Statistical Area (CSA) of Raleigh-Durham-Cary. The estimated population of the Raleigh-Durham-Cary CSA was 1,749,525 at the 2010 census, with the Raleigh-Cary Metropolitan Statistical Area (MSA) portion at 1,130,490 residents as of April 1, 2010. Wake County is the 9th fastest growing county in the United States, with the town of Cary and the city of Raleigh being the 8th and 15th fastest growing cities, respectively. It is governed by the Wake County Board of Commissioners. The earliest known inhabitants of present-day Wake County were the Tuscarora Native Americans. They were defeated in the Tuscarora War in 1711, and moved to New York to join the Iroquois nation. Wake County was formed in 1771 from parts of Cumberland County, Johnston County, and Orange County. It was named for Margaret Wake, wife of Governor William Tryon. The first courthouse was built at a village originally called Wake Courthouse, now known as Bloomsbury. In 1771, the first elections and court were held, and the first militia units were organized. Wake County lost some its territory through the formation of other counties. Parts were included in Franklin County in 1787, and in Durham County in both 1881 and 1911. Raleigh was named after Sir Walter Raleigh and established in 1792 on 1,000 acres (4.0 km2) purchased from Lane. Raleigh had never set foot in the North Carolina, but he had sponsored the establishment of the first English colony in North America on North Carolina's Roanoke Island in 1585. The city of Raleigh became both the state capital and the new seat of Wake County. The county is governed by the Wake County Board of Commissioners, a seven-member board of County Commissioners, elected at large to serve four-year terms. Terms are staggered so that, every two years, three or four Commissioners are up for election. The commissioners enact policies such as establishment of the property tax rate, regulation of land use and zoning outside municipal jurisdictions, and adoption of the annual budget. Commissioners meet on the first and third Mondays of each month. Current members of the Wake County Board of Commissioners are Paul Coble (Chair), Phil Matthews (Vice-Chair), Joe Bryan, Tony Gurley, Ervin Portman, Betty Lou Ward, and James West. David Cooke is the County Manager. While North Carolina is historically a conservative state, Wake County is more of a swing voting area. Although Democratic presidential candidates have only won the county in four of the last 13 elections (Kennedy in 1960, Johnson in 1964, Clinton in 1992 and Obama in 2008), the races have almost always been close, such as in 1980, when Ronald Reagan won by a landslide nationwide, but by a mere 1% in Wake County. Recently, Republican George W. Bush won the county in 2000 with 53% and defeated John Kerry in 2004 by a slim 51% to 49%. In 2008 Democrat Barack Obama defeated John McCain 56-43%. Recently, statewide Democrats have fared well here. In the 1998 Senate race, John Edwards won in Wake County, which helped him defeat incumbent Republican Lauch Faircloth. In 2000 Mike Easley won the governor's race here with 55% of the vote. In 2004, Easley won again, winning with 59% to 40% for opponent Patrick Ballantine. Democrat Beverly Perdue won Wake County in the 2008 Governor's election by a 51%-45% margin. Democratic candidate for US Senate Erskine Bowles won the county with 52 percent, despite losing statewide to Richard Burr by the same margin. In 2002, however, Republican Elizabeth Dole defeated Bowles with 55% of the vote here, and won by a large margin statewide. In 2008 Kay Hagan defeated Dole 56-40%. Democratic voters are mainly located in the city of Raleigh, while Republicans are the majority in the rural areas in the north and western parts of the county. The outskirts of Raleigh, and the cities of Cary and Apex are where most of the swing voters are located and thus where moderates have recently voted Democratic. According to the U.S. Census Bureau, the county has a total area of 857 square miles (2,220 km2), of which 832 square miles (2,150 km2) is land and 25 square miles (65 km2), or 2.95%, is water. Wake County enjoys a moderate subtropical climate, with moderate temperatures in the spring, fall, and winter. Summers are typically hot with high humidity. Winter highs generally range in the low 50s°F (10 to 13 °C) with lows in the low-to-mid 30s°F (-2 to 2°C), although an occasional 60°F (15°C) or warmer winter day is not uncommon. Spring and fall days usually reach the low-to-mid 70s°F (low 20s°C), with lows at night in the lower 50s°F (10 to 14°C). Summer daytime highs often reach the upper 80s to low 90s°F (29 to 35°C). The rainiest months are July and August. Wake County's unemployment rate is much lower than the national unemployment rate as of July 2010. Wake County's industrial base includes electrical, medical, electronic and telecommunications equipment; clothing and apparel; food processing; paper products; and pharmaceuticals. The agriculture industry is visible in rural areas of the county, with tobacco, cotton, wheat, soybeans and corn being the most common products grown. SAS Institute, one of the largest privately held software companies in the world, is located in Cary. Other major companies based in Wake County include RBC Centura, Progress Energy Inc, Dex One, 3Dsolve, Carquest, Bear Rock Foods, Cotton Incorporated, Epic Games, Lord Corporation, Lenovo Group (U.S. headquarters), Tekelec, Red Hat, Golden Corral and Martin Marietta Materials. As of the census of 2000, there were 627,846 people, 242,040 households, and 158,778 families residing in the county. The population density was 755 people per square mile (291/km²). There were 258,953 housing units at an average density of 311 per square mile (120/km²). The racial makeup of the county was 72.40% White, 19.72% Black or African American, 0.34% Native American, 3.38% Asian, 0.03% Pacific Islander, 2.48% from other races, and 1.64% from two or more races. 5.41% of the population were Hispanic or Latino of any race. In the county the population was spread out with 25.10% under the age of 18, 10.70% from 18 to 24, 36.50% from 25 to 44, 20.40% from 45 to 64, and 7.40% who were 65 years of age or older. The median age was 33 years. For every 100 females there were 98.40 males. For every 100 females age 18 and over, there were 96.50 males. Municipalities, with populations as of the 2010 census. Municipalities in italics overlap county borders, and these population figures reflect only the part of those municipalities that lie within Wake County. The county is divided into twenty townships: Bartons Creek, Buckhorn, Cary, Cedar Fork, Holly Springs, House Creek, Leesville, Little River, Marks Creek, Meredith, Middle Creek, Neuse, New Light, Panther Branch, Raleigh, St. Mary's, St. Matthew's, Swift Creek, Wake Forest, and White Oak. Public education in Wake County is administered by the Wake County Public School System, the 18th largest public school district in the country with over 134,000 students. There are 20 high schools, 30 middle schools, 93 elementary schools and 8 specialized schools. In addition, nine charter schools and 31 private schools are located in the county. Wake County is ranked the #1 school district in the country for certified teachers. The Wake County Public Library system operates 20 branches throughout the county. There are 10 facilities in Raleigh. Cary, Morrisville, Apex, Holly Springs, Fuquay-Varina, Garner, Wake Forest, Zebulon, Knightale, and Wendell each have one library facility. The Wake County library system keeps books, periodicals and audio books and has recently expanded the selection to include downloadable e-books. The Walnut Creek Amphitheatre hosts major international touring acts. The Progress Energy Center for the Performing Arts complex houses the Raleigh Memorial Auditorium, the Fletcher Opera Theater, the Kennedy Theatre, and the Meymandi Concert Hall. During the North Carolina State Fair, Dorton Arena hosts headline acts. Theater performances are also offered at the Raleigh Little Theatre, Theatre in the Park and Stewart Theater at North Carolina State University in Raleigh. Applause! Cary Youth Theatre, Cary Players Community Theatre, Sertoma Amphiteatre at Bond Park, and Koka Booth Amphitheatre are located in Cary. Other theatre and performing arts locations include The Halle Cultural Arts Center in Apex and Garner Historic Auditorium in Garner. Local colleges and universities add to the options available for viewing live performances. The North Carolina Museum of Art, occupying a large suburban campus on Blue Ridge Road near the State Fairgrounds, houses one of the premier public art collections between Washington, D.C. and Atlanta. In addition to collections of American art, European art and ancient art, the museum recently has hosted major exhibitions featuring Auguste Rodin (in 2000) and Claude Monet (in 2006-07), each attracting more than 200,000 visitors. Unlike most public museums, the North Carolina Museum of Art acquired a large number of the works in its permanent collection through purchases with public funds. The museum's outdoor park is one of the largest such art parks in the country. The National Hockey League's Carolina Hurricanes franchise moved to Raleigh in 1999 from their temporary home of Greensboro, after having departed Hartford, Connecticut, in 1997. Their home arena, the RBC Center, also hosts concerts and other public events. The Hurricanes are the only major league (NFL, NHL, NBA, MLB) professional sports team in North Carolina to have won a championship, winning the Stanley Cup in 2006, over the Edmonton Oilers. The Carolina Railhawks of the United Soccer Leagues are located in Cary and play at the WakeMed Soccer Park. The Carolina Mudcats are a minor league baseball team located in eastern Wake County. The team, which plays in the Southern League, is the Double-A affiliate of the Cincinnati Reds. Their ballpark, Five County Stadium, is located in Zebulon. 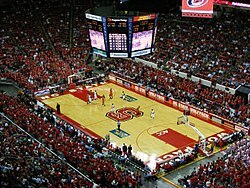 North Carolina State University, which is a member of the Atlantic Coast Conference (ACC) and National Collegiate Athletic Association (NCAA) Division I, plays their home basketball games at the RBC Center and home football games at Carter-Finley Stadium. Other institutions of higher learning that compete in competitive sports include St. Augustine's College (NCAA Division II, Central Intercollegiate Athletic Association (CIAA)), Meredith College (NCAA Division III and USA South Athletic Conference), Peace College (NCAA Division III and USA South Athletic Conference), and Shaw University (NCAA Division II, CIAA). Regional Rail - Plans are being made for a light rail system that would be built over the next 10 to 20 years. I-440 is a beltway that encircles most of downtown Raleigh. The southern portion of the beltway is I-40. I-540/NC-540 is a 66-mile (106 km) partially completed loop that will connect the satellite towns of Wake Forest, Knightdale, Garner, Apex, Cary, Morrisville, Rolesville, and Fuquay-Varina. The completed portions are called the Northern Wake Expressway in northern Wake County and the Western Wake Parkway in western Wake County. Major highways that run through Wake County include US 1, US 64, US 264, US 70, and US 401. Other highways include NC 55, NC 42, NC 50, 751, NC 39, NC 98, and NC 231. Wake County is home to three state parks: Falls Lake State Recreation Area, William B. Umstead State Park, and the Jordan Lake State Recreation Area. Falls Lake Park is located in northern Wake County and contains the 12,000-acre (49 km2) Falls Lake and 26,000 acres (105 km2) of woodlands. Umstead Park is situated between Raleigh and Cary near RDU. Located right off I-40, it is divided into two sections, Crabtree Creek and Reedy Creek, and contains 5,579 acres (22.577 km2) of woodlands. 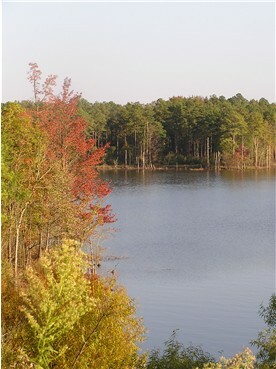 Jordan Lake Park, which is partially located in Wake County near Apex, contains 13,940-acre (56.41 km2) Jordan Lake and 46,768 acres (189.263 km2) of woodlands. This park is known for being home to bald eagles. Wake County is served by three hospitals, Rex Hospital, WakeMed, and Duke Raleigh Hospital. In addition to WakeMed's primary facility, the hospital also operates seven satellite locations throughout the county. These locations include North Raleigh, Cary, Fuquay-Varina, Zebulon, Wake Forest, Apex, Wake Forest Road, and Brier Creek. ^ United States Census Bureau. "2010 Census Data". United States Census Bureau. http://2010.census.gov/2010census/data/. Retrieved 21 August 2011. ^ Christie, Les. "Wake County, North Carolina". CNN. http://money.cnn.com/galleries/2007/real_estate/0703/gallery.fastest_growing_counties/9.html. Retrieved May 27, 2010. ^ "The 258 fastest growing U.S. cities". CNN. June 27, 2007. http://money.cnn.com/2007/06/27/real_estate/258_fastest_growing_cities/index.htm. Retrieved May 27, 2010. ^ Powell, William. Encyclopedia of North Carolina. University of North Carolina Press. pp. 1172–1173. ISBN 0807830712. http://uncpress.unc.edu/nc_encyclopedia/. ^ a b "Commission Facts.". WakeGOV.com. Wake County. http://www.wakegov.com/commissioners/aboutboc.htm. Retrieved 11 January 2012. ^ "Wake County Board of Commissioners & Elected Officials". WakeGOV.com. Wake County. http://www.wakegov.com/commissioners/default.htm. Retrieved 11 January 2012. ^ Clark, Hannah. "By The Numbers: The 25 Best U.S. Cities For Jobs - Forbes.com". Forbes. http://www.forbes.com/home/2007/02/15/best-cities-jobs-leadership-careers_cx_hc_0216cityjobs_slide_2.html?thisSpeed=15000. ^ "#1 Raleigh NC - Forbes.com". Forbes. April 5, 2007. http://www.forbes.com/lists/2007/1/07bestplaces_Raleigh-NC_100138.html. ^ "America's best jobs in the hottest markets". CNN. http://money.cnn.com/galleries/2007/biz2/0704/gallery.jobs_markets.biz2/3.html. Retrieved May 27, 2010. ^ "bizjournals: Rank of large metros for young adult job seekers". http://www.bizjournals.com/specials/pages/73.html. ^ "Raleigh Attractions". The New York Times. http://travel.nytimes.com/travel/guides/north-america/united-states/north-carolina/raleigh/attraction-detail.html?vid=1154654619261. Retrieved May 27, 2010. This page uses content from the English language Wikipedia. The original content was at Wake County, North Carolina. The list of authors can be seen in the page history. As with this Familypedia wiki, the content of Wikipedia is available under the Creative Commons License.